Proyecto Acción Transformadora develops representative cohorts of promising future political leaders with the capacity to address some of the country’s most pressing challenges. By preparing and linking future political leaders and traditionally isolated youth advocacy efforts, our network of leaders is equipped to engage in transformative solutions, ethical practices, and critical analysis that will ultimately help build renewed trust in the democratic process, bring an end to disenfranchisement, and institute policies that contribute to a more equitable and prosperous country. This five-year cooperative agreement with USAID targets youth ages 16-35 to activate potential leaders, strengthen and mobilize developing leaders, and support leaders in action as they catalyze change within the country’s most marginalized communities. Through project activities, participants are prepared to address Guatemala’s volatility, lack of government accountability, and a political system that does not best represent or promote the needs of many youth who desire improved opportunities for inclusion, education, and employment. Target Population: While the project is designed to work with youth up to the age of 35, it will particularly focus on youth aged 16-24 years old, which is the population most at risk for violence and migration. Geographic Focus: Project efforts to activate potential youth leaders currently focus on the Western Highlands region of Guatemala and urban areas around the capital city. Beyond this, opportunities for developing and already active youth leaders to participate in educational programs and the project network are open to youth nation-wide. 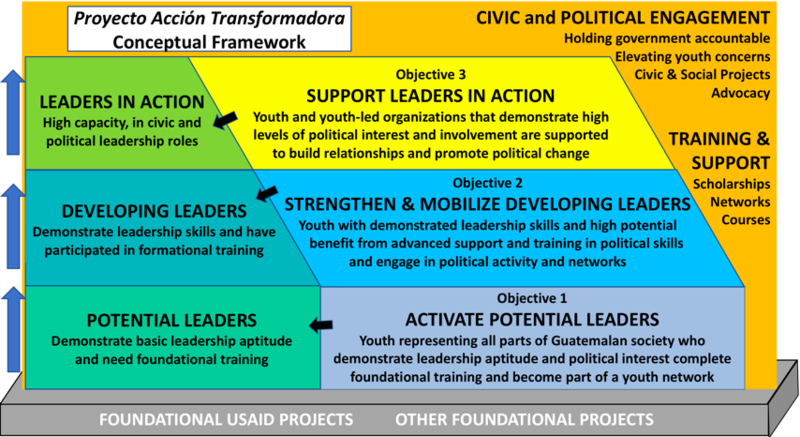 Activate Potential Leaders: Youth from all parts of Guatemalan society who demonstrate leadership aptitude and political interest build their leadership skills and engage in local political networks. Strengthen and Mobilize Developing Leaders: Youth with demonstrated leadership skills and high potential build and apply advanced political leadership skills and engage in broader political activity networks. Support Leaders in Action: Youth and youth-led organizations that demonstrate high levels of political interest and involvement work collaboratively with others to promote political change. Proyecto Acción Transformadora is building a cadre of future political leaders with the capacity to address some of the most pressing challenges facing Guatemala. Participants at each level described above will be prepared to address Guatemala’s volatility, lack of accountability in a government, and a political system that does not best represent or promote the needs of many youth who desire improved opportunities for inclusion, education and employment. Project activities target a diverse selection of youth from rural, urban, and peri-urban areas, while still engaging middle/professional-class youth leaders to create a network of leaders, and youth-led organizations to build bridges of collaboration within Guatemala’s largest voting demographic group during a crucial political moment. Youth-Led Project Advisory Committee: The project is informed by a dynamic and highly motivated Youth Advisory Committee of 16 highly diverse and successful Guatemalan youth, formed by IREX to ensure that representative youth voices are heard and available to the technical team at every step of the way. Foundational Political Training for Potential Leaders: The training curriculum and methodology for potential leaders were developed by Proyecto Acción Transformadora, together with World Vision and Paz Joven, a Guatemalan youth-led NGO, focuses on key elements of leadership in the Guatemalan political realm, while also exploring the context of politics in Guatemala based on history, Guatemalan government structures and processes, and the political system. This training is built around the concept of transformative leadership and incorporates an active, experiential approach that provides youth opportunities to learn and practice skills and dynamics that can become part of their own leadership tools and development. This curriculum can be adapted to prepare young leaders for civic and political change in a variety of contexts. Scholarship Opportunities: The project’s scholarship program focused on developing leaders has identified and selected 156 participants from priority populations for scholarships or courses offered by our partners. These short courses, certificate programs, and master’s degree programs will better position these developing leaders for future leadership roles and also connect participants to a network of similarly talented and motivated change makers. Organizational Strengthening: IREX will provide resources to youth groups and youth-led organizations to strengthen their efforts and their own organizational capacity. The project works with the Netherlands Institute for Multiparty Democracy (NIMD) and the Pan American Development Foundation (PADF) to identify and provide highly structured organizational support to 13 organizations. Build Networks for Young Political Leaders: IREX draws from its research and experience in the creation of a strong, multi-layered network of youth civic and political leaders that reaches youth and connects them to civic and political participation opportunities. The project will create a unified force for change among the many youth-led efforts toward stemming and preventing corruption across the country, including the voices of traditionally marginalized groups in Guatemala. A critical component of this network is to identify mentors who will contribute to individual capacity-building, motivate peers, and shape a sustainable model for Guatemala.